Today the ship was moored at Würzburg. 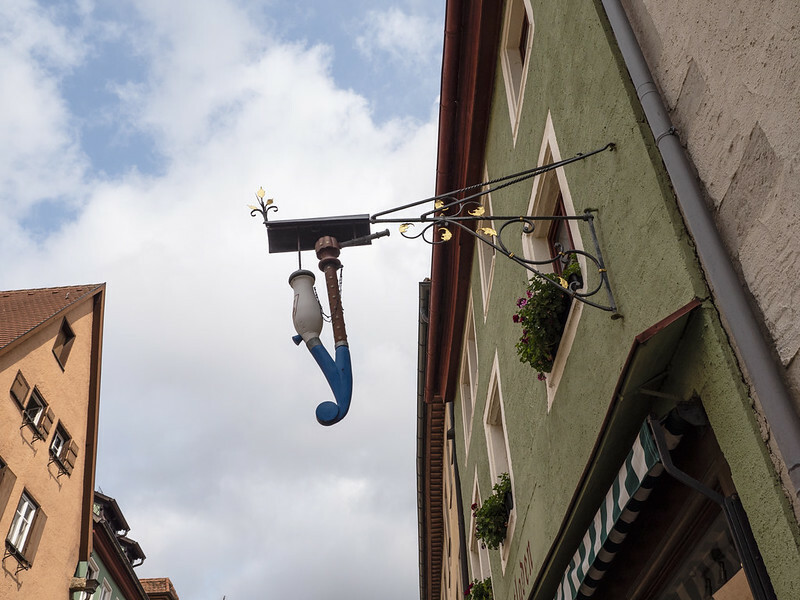 There is quite a lot to see here, but we decided to book the optional excursion to Rothenburg (full name Rothenburg ob der Tauber). Our guide for the day was Monica, who seemed to me a little eccentric. She was a PhD student who spoke 5.5 languages (the 0.5 being Welsh). She is an Austrian who normally lives in France, but she comes to Würzburg for the Summer. As well as lots of details about the things we visited she gave us almost too much information about her life, including her medical history and the fact that she once had a major rat infestation at her house! She seemed young, but I suspect was much older than she looked. She was amused that somebody thought she was in her thirties, but wouldn’t tell us her actual age! 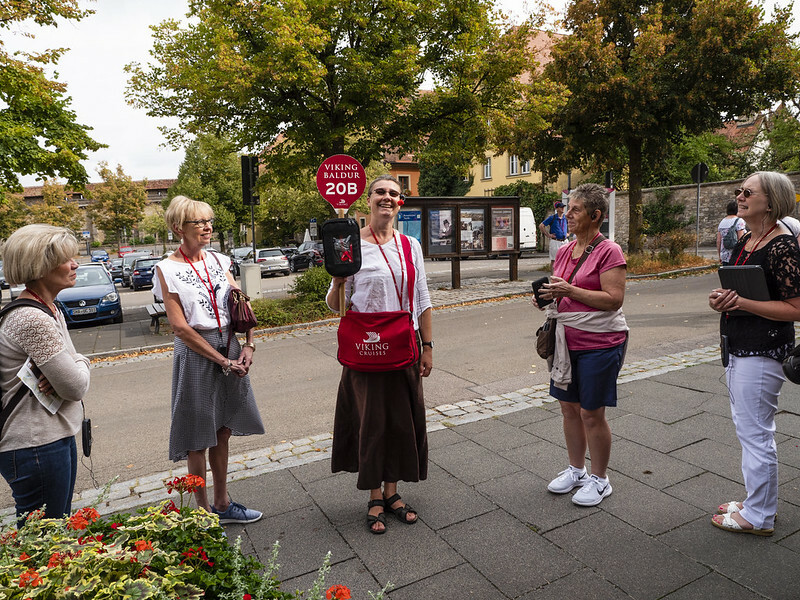 We set off around 09.00 and headed off down the so-called Romantic Road which runs between Würzburg and Füssen. 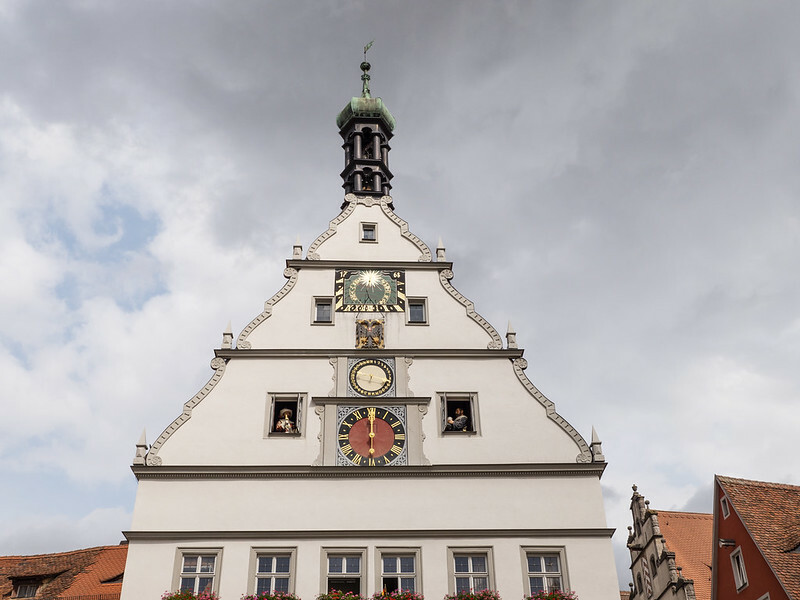 Rothenburg is regarded as the best preserved medieval town in Germany. It has a surrounding wall that is 1.5 miles long. 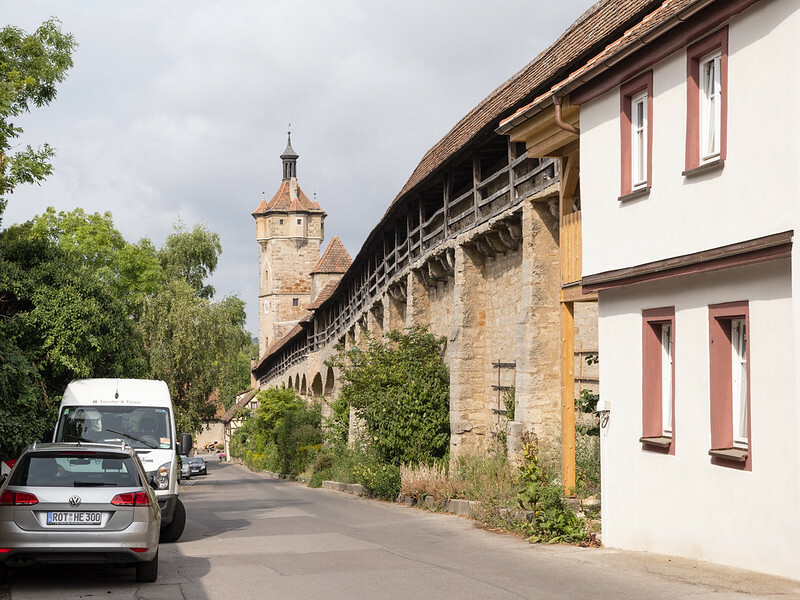 The wall connects 5 gates with guard towers that date from the 13th to the 16th centuries. We took loads of pictures, including some of the clock tower in the central square. 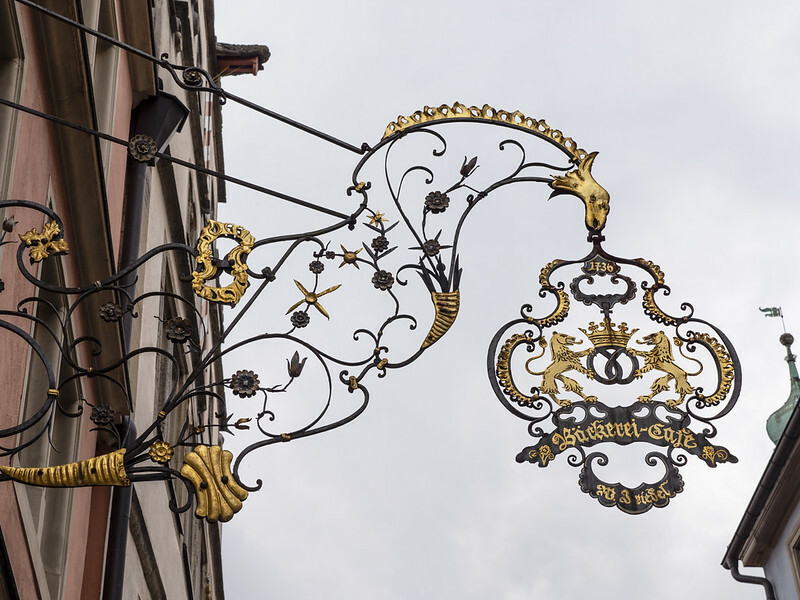 One of the nice things about Rothenburg was the variety of ornate signs for the local hotels and businesses. We then had lunch which, although the main course included the omnipresent German sausages, was about the best excursion lunch we had had so far. 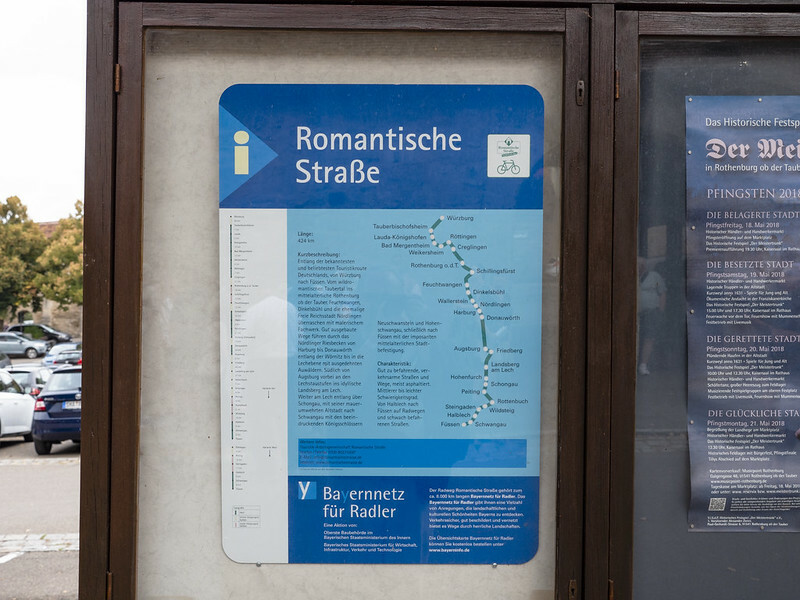 After lunch we set off on our buses to Würzburg, managing to lose 2 of our fellow passengers in the process. Fortunately, they later turned up. 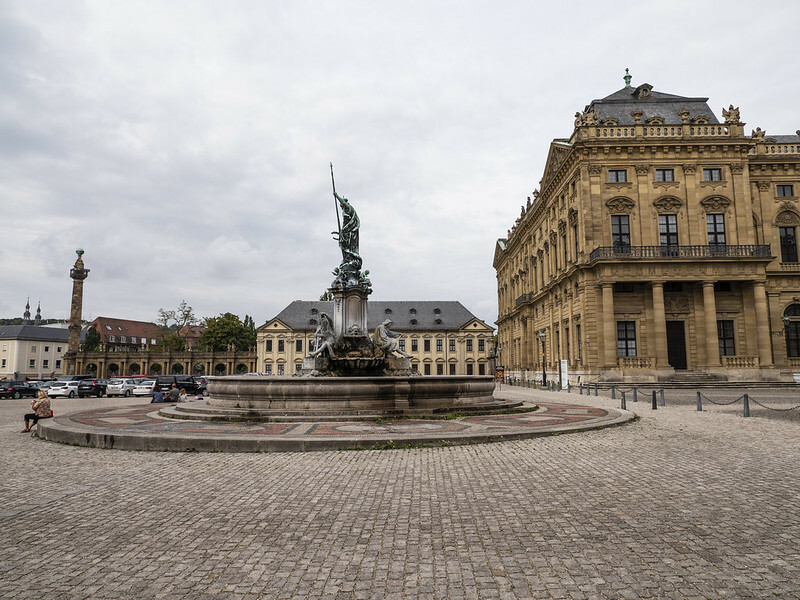 We were taken to see the Würzburg Bishops’ Residenz, which is one of Germany’s finest baroque palaces. 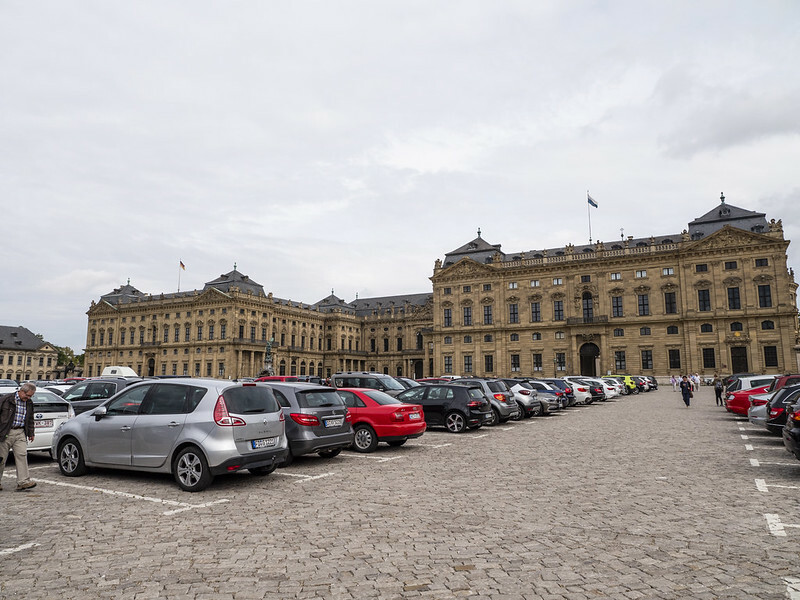 It was designed by Balthasar Neumann, and features a grand staircase with an unsupported vaulted ceiling featuring the largest ceiling fresco in the World. The Four Continents was created between 1752 and 1753 by the Venetian painter Giovanni Batista Tiepolo. We returned to the ship and had another excellent dinner. Prior to this it was confirmed that the day after tomorrow we will be swapping onto another Viking ship to complete our holiday. We are hoping that we will be able to stay on that ship all the way to Budapest.